Plastic and coloured laser paper. 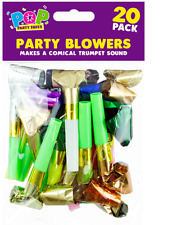 Fun Party Horns that make a fun trumpet sound when blown. 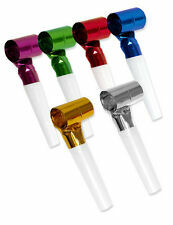 Each blower makes a fun sound when blown and is ideal for parties and celebrations. Good for party loot bag filler and ideal for Christmas. Foil Blow out with a plastic blow tube. you get a mix of colours as pictured. "The ideal party noise toy". 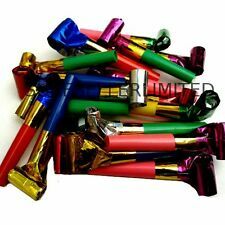 Siumir 100 x Blowouts Noisemakers -- Funny Party Blowouts Blowers for kids, Assorted Color. Receive it within 24 hours from order! In case of any problem we will help. 100% Support! We do our best to process as quickly as possible. 3pc Lot 1997 Franklin the Turtle Party Goods NOS. One 18" Mylar Balloon. Lot includes. And One 18" Mylar Balloon. One set-12 Cupcake Picks. 4 piece Lot includes. Rolled up paper blowout attached to a plastic noisemaker. Convenient size allows easy, confident hold. Fun, party décor. Material : Paper and Plastic. Recyclable paper blowout and safe plastic mouthpiece. Fun, party décor. Easy to use and great value too. Our goal is. Include:10 pcs. Style:The Style Is Random. Fun, party décor. Material : Paper and Plastic. Style:The Style Is Random. Our goal is. Recyclable paper blowout and safe plastic mouthpiece. Rolled up paper blowout attached to a plastic noisemaker. 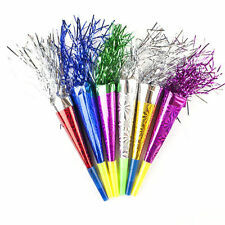 Party blowers are a great, fun party accessory. The blowers extend when blown and make a comical trumpet sound. Perfect for all parties and social gatherings. Our product images are for illustrative purposes only and therefore may differ from the actual product.